Dominique Dunne died tragically. She was born to a life of privilege in Santa Monica. After her parents' divorce, she moved first to New York, then to a posh home in Beverly Hills. Upon graduation from high school, Dominique went to the University of Colorado to study acting, leaving after one year to pursue her career. One notable role was as Dana Freeling, the eldest daughter in "Poltergeist". Then, at a party she met John David Sweeney, the chef at popular LA nightspot Ma Maison. The two began a relationship, which turned stormy. Sweeney was uncontrollable and abusive. 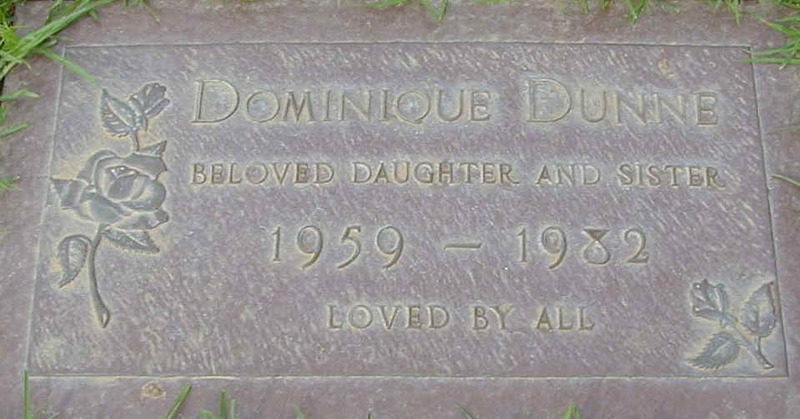 Dominique ended the relationship on October 30, 1982. That same night, a distraught Sweeney raced to her house, where she and actor David Packer were rehearsing a scene from V, dragged her outside, and strangled her, leaving her brain dead. Five days later, she was removed from life support and died.